BANGKOK — The weather over the Indonesian capital, Jakarta, was sunny with little wind. The plane was a pristine Boeing that had taken to the skies only in August. But shortly after 6:30 on Monday morning, after a jagged takeoff full of unexplained descents, Lion Air Flight 610 plunged into the Java Sea with 189 people on board. No survivors have been found. The exact sequence of events that led to yet another aviation disaster in Indonesia is still unclear, and may emerge only once flight-data recorders are recovered from the waters northeast of Jakarta. But the crash took place in broad daylight and good weather, and involved a new plane. So experts are looking to see if an underlying problem, either mechanical or human or both, may have caused it. One theory is that the pilots received inaccurate altitude or speed readings from probes affixed to the outside of the airplane, part of a sensitive set of instruments called the pitot-static system. Problems with these instruments are thought to have contributed to other crashes. And they may have been the issue the night before the crash, when the same Lion Air plane experienced problems flying to Jakarta from the resort island of Bali. The accuracy of the probes can be affected if they ice over or are inundated by moisture or insects. On Tuesday afternoon, Indonesian transportation officials acknowledged that they had not spoken to ground crews about the plane and the problems it experienced after it left Bali. 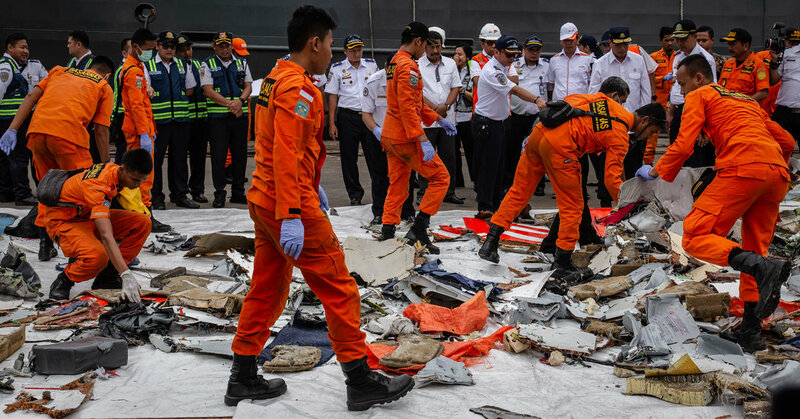 “We haven’t questioned the engineer or the technicians from Sunday’s flight yet because we have very limited human resources,” said Ony Soerjo Wibowo, an air safety investigator for the Indonesian Transportation Safety Committee, which is taking the lead in the inquiry into the crash. It is also possible, experts said, that the type of plane involved in the crash — the Boeing 737 Max 8, which entered commercial service only around a year and a half ago — may have another flaw that had not manifested itself in other fleets before because it is so new. Pilots and aviation analysts, however, cautioned that they had not heard chatter about any such problem afflicting other Max 8 planes. So could this be another case of lax safety and maintenance standards in Indonesia? Lion Air has a troubling air-safety record, with at least 15 major incidents. The company’s spate of problems mirrored a surge in crashes that afflicted the entire Indonesian aviation industry, causing Western nations to ban Indonesian carriers. Pilots who worked for Lion Air and its competitors in Indonesia said training for flight and ground crews sometimes did not keep up with the latest developments in new planes. And aviation experts have raised questions about whether pilots like Bhavye Suneja, the captain of Flight 610, are given adequate training in flying planes during emergency conditions or in handling new technology like that in the Max 8. The 737 Max family of planes is Boeing’s fastest-selling in history, the company said, with nearly 4,700 orders worldwide. Indonesian transport authorities said they had ordered an inspection of all the Max 8 jets operated by domestic carriers. On Tuesday, Mr. Ony, the Indonesian safety investigator, said the immediate priority was finding the so-called black boxes — the flight data recorder and cockpit voice recorder — which may offer critical information about what happened in the final minutes of the flight. Divers at the watery crash site also continued the grim task of recovering dozens of human remains, including those of a baby who was on the flight. On Wednesday morning, officials said that an object large enough to be the main part of the plane’s fuselage had been located. A team of United States government and Boeing investigators was to arrive in Indonesia on Wednesday evening to assist the Indonesian safety committee in the inquiry, Indonesian authorities said. The crash of Flight 610 occurred minutes after the plane took off from Jakarta at 6:21 a.m. Monday, bound for the small city of Pangkal Pinang off the island of Sumatra. Shortly before the plane went down, the flight crew requested permission to return. The flight, captained by Mr. Suneja, a 31-year-old Indian citizen who had worked for Lion Air for seven years, then plummeted more than 500 feet, banked left and continued a roller-coaster ride until slamming into the Java Sea around 13 minutes later. The erratic flight path appeared to mirror problems the plane had on Sunday night when flying from Bali, and it has drawn attention to the pitot-static system. Malfunctions in that system are believed to have contributed to the disappearance of Air France Flight 447 over the Atlantic Ocean off Brazil in 2009. And in July, a Malaysia Airlines flight took off from Brisbane, Australia, with covers still affixed to three pitot tubes, causing inaccurate airspeed indications. The plane was forced to return to Brisbane but landed safely. Lion Air’s president director, Edward Sirait, confirmed on Monday that the plane had experienced some kind of technical issue during the flight on Sunday, but he did not say what the exact problem was. But if the plane had a problem with inaccurate speed or altitude measurements on the captain’s side, as maintenance logs seen by Indonesian aviation experts seem to indicate, the normal procedure would have been to return to the airport from which it took off for immediate troubleshooting, aviation analysts said. That was what the Malaysia Airlines flight did in July. Instead, the Lion Air flight continued on to Jakarta on Sunday. Why it did is one of many mysteries surrounding the crash. Lion Air, the flag carrier of the Lion Air Group, started operations in 2000 in Indonesia, a country of more than 13,000 islands flung across the Equator. Desperate for an alternative to ferries that seemed cursed by chronic deadly accidents, Indonesians flocked to the budget carrier, making it one of the world’s fastest-growing airlines. As of 2017, the Lion Air Group, which includes other carriers like Batik Air, Wings Air and Malindo Air, controlled 51 percent of the domestic aviation market. To keep up with surging demand, the company snapped up new planes, signing record deals with Airbus and Boeing. But as it grew, Lion Air had significant safety problems. In 2004, 25 people were killed when a Lion Air flight overshot the runway in the city of Surakarta. In 2013, a rookie pilot landing in Bali propelled a new Boeing 737 into the sea. No one died in that incident. In recent years, Lion Air jets have collided with other Lion Air Group planes, along with a cow. Pilots have been caught using drugs. Yet aviation experts also say Lion Air has improved its safety in recent years. In June, a European Union blacklisting of Indonesian carriers was lifted after more than a decade of safety worries. The United States revoked its ban in 2016. Even as management said safety was a priority, pressure remained to keep flights operational, one veteran Lion Air pilot who also worked as a trainer said. Hours could be brutal, up to 22 hours on duty, said pilots who worked for the airline. As it expanded, Lion Air Group accumulated significant political influence. The company’s co-founder, Rusdi Kirana, is deputy chairman of a political party that supported President Joko Widodo of Indonesia. Former and current Lion Air pilots complained about employment agreements that treated them as temporary workers, even as they were forced to pay onerous fines if they left the company after many years. Two years ago, 18 Lion Air pilots were dismissed after they tried to organize a strike and a union. After their firing, the pilots sued Lion Air for severance and other benefits, but nine other pilots are now in prison, accused of falsifying documents to breach their contracts. “This kind of contract has forced pilots to work in low morale conditions,” said Hasan Basri, one of the 18 fired pilots.